Women's trousers available in 2 materials: denim and polycotton ripstop and 5 colors: blue, black, beige, olive drab and shadow grey. The Helikon company was founded in 1983, it produces clothes for the army, security and special services: trousers and shirts, jackets with membrane fabrics, hats, knitted jackets, and many more. 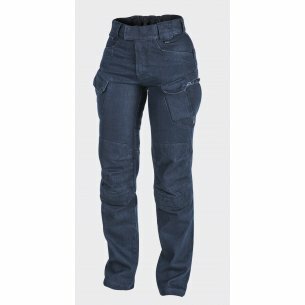 Women's helikon tex pants are the most recognizable and sold products of the Polish manufacturer Helicon Tex. Versatile, comfortable, women's trousers are represented by a wide range of colors and various types of modern materials. The cut of military pants meets the expectations of many women who buy them for everyday use, for use during trips or various fitness tests. The stylish ergonomic design does not distinguish these military pants too much and does not attract excessive attention. This is the basic principle that designers have observed. 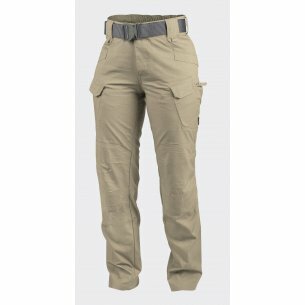 The women's helikon tex women's trousers have been designed to meet the anatomical features of a woman's figure. Women's pants allow you to carry large amounts of equipment, and the elastic material does not slow down movements when performing tactical tasks. Their civilian style appeals to women who are not related to militaries and willingly bring them into their wardrobe. A distinctive feature of the women's trousers is the adjustable belt with a wide Velcro flap, a knee pad compartment and an anatomical reinforcement for the knees. The equipment of the trousers in the 12 pockets gives many possibilities to carry the necessary things in different situations. 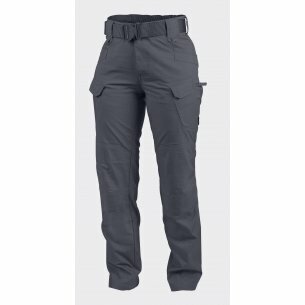 Tactical pants womens utp look like ordinary clothing, every day, but at the same time have a comfortable cut and a set of pockets, like utilitarian military pants. Designed for law enforcement officers, womens utp pants allow you to wear all the necessary equipment on your hips and waist. The low profile of the pockets allows you to conveniently place items, every day or ammunition. In this case, objects are placed near the center of gravity of the body, which increases the comfort of wearing. In addition, all of these solutions provide different use options. Women's helikon tex pants will be a great addition to wear every day thanks to a comfortable anatomical cut, a large number of pockets and elastic fabric. The tex womens urban tactical line is designed specifically for women. And although they look externally like ordinary trousers, their properties correspond to the functionality of military militias. They are comfortable, have a large number, because a total of 12 tactical pockets, compartments, to hide wearing different types of items. The belt, as with most military trousers, in addition to the main buckle, is additionally equipped with a buckle. The area of ​​the knee is strengthened. The fabric stretches well and allows you to perform sharp, flexible movements without any problems. First of all, pants are designed for women working in the structures of law enforcement agencies and the like, but they can be worn by civilian women who prefer military style. Polycotton Ripstop material is 60% cotton, 37% polyester, 3% spandex. The women's helikon tex pants fit perfectly into the figure of women. Military trousers allow you to wear all the necessary equipment on the belt and in the pockets. The design of the pocket has a special mechanism and allows the equipment to be placed near the center of gravity of the body, which in combination with a flexible fabric leads to fast and accurate tactical movements. While maintaining the external features of civilian UTP trousers, it creates opportunities typical for military militias. Jeans: 80% cotton, 19% polyester, 1% spandex. Adjustment at the waist provides a flat, durable elastic band and a wide Velcro buckle sewn in at the back of the belt. Classic denim cut prevents slipping trousers. The design of military belts with a flexible belt with Velcro ensures precise fit, key chains compatible with snap hooks. Interestingly, the leg of the women's trousers at the back is also profiled, it is divided and connected using the profiling tab under the knee. All this provides a very good freedom of movement and does not restrict the legs during squat or kneeling. All womens utl pants have YKK zips.